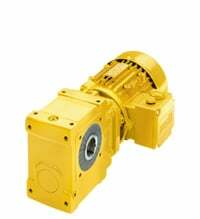 Due to the unique combination of newly developed worm wheel material with special lubricants, extreme precision and optimized shapes, this powerful motor achieves comparatively high levels of efficiency and torque. The case machined on all sides enables diverse mounting options. Double-chamber shaft seals made of HNBR are used as standard, guaranteeing complete leak tightness. Unbelievable price on Helical worm geared motors in Shah Alam (Malaysia) company Watt Euro-Drive (Malaysia), Sdn. Bhd..